Can I change the schedule for a campaign that is already active? One of the frequently asked questions is if there's a way to change the schedule used for a certain sequence when it's already running. Open the list of your campaigns by clicking on the Campaign tab. Select a campaign you want to change the schedule by clicking on it. Open the Steps page of the campaign interface. 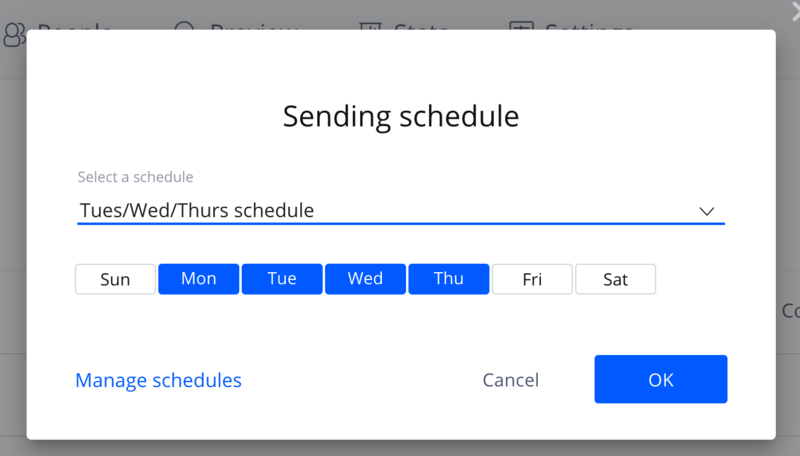 Click on the Sending schedule drop down list to select a new schedule. Note: you must create an alternate schedule first to be able to change the campaign schedule. To do this, navigate to the Schedules page of the Settings tab and click Create new schedule.